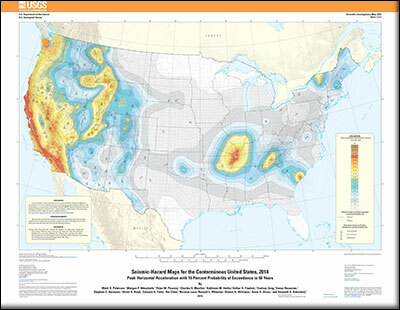 The maps presented here provide an update to the 2008 data contained in U.S Geological Survey Scientific Investigations Map 3195 (https://pubs.usgs.gov/sim/3195/).Probabilistic seismic-hazard maps were prepared for the conterminous United States for 2014 portraying peak horizontal acceleration and horizontal spectral response acceleration for 0.2- and 1.0-second periods with probabilities of exceedance of 10 percent in 50 years and 2 percent in 50 years. All of the maps were prepared by combining the hazard derived from spatially smoothed historical seismicity with the hazard from fault-specific sources. The acceleration values contoured are the random horizontal component. The reference site condition is firm rock, defined as having an average shear-wave velocity of 760 m/s in the top 30 meters corresponding to the boundary between NEHRP (National Earthquake Hazards Reduction program) site classes B and C.
This data set represents the results of calculations of hazard curves for a grid of points with a spacing of 0.05 degrees in latitude and longitude. The grid of points was contoured to produce the final representation of the seismic hazard. These maps are intended to summarize the available quantitative information about seismic ground motion hazard for the conterminous United States from geologic and geophysical sources. Contains: GIS data and Shapefiles. Refer to the README file for more information about these digital files. Petersen, M.D., Moschetti, M.P., Powers, P.M., Mueller, C.S., Haller, K.M., Frankel, A.D., Zeng, Yuehua, Rezaeian, Sanaz, Harmsen, S.C., Boyd, O.S., Field, E.H., Chen, Rui, Luco, Nicolas, Wheeler, R.L., Williams, R.A., Olsen, A.H., and Rukstales, K.S., 2015, Seismic-hazard maps for the conterminous United States, 2014: U.S. Geological Survey Scientific Investigations Map 3325, 6 sheets, scale 1: 7,000,000, https://dx.doi.org/10.3133/sim3325.